This weekend, we headed up to Western Massachusetts to ride with the JAM Fund development cyclists, along with seasoned pros like Stephen Hyde, Tim Johnson, Cassie Maximenko, Anthony Clark and of course, Jeremy Powers. Two weeks ago, we caught up with Powers to talk about the ride, as well as his season goals. 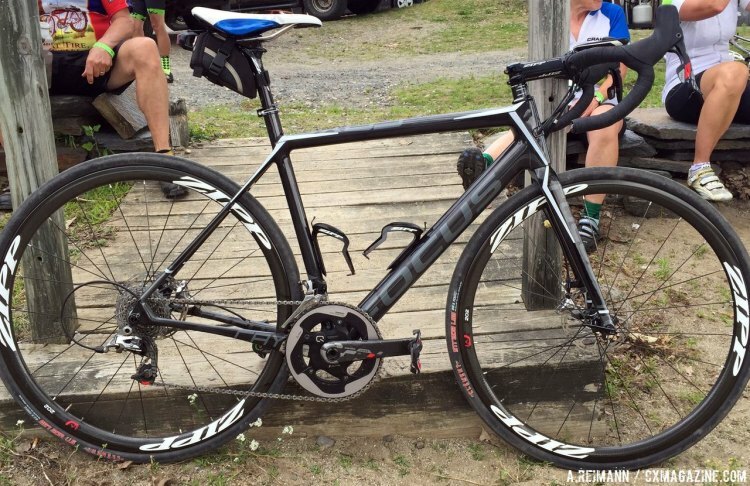 While you can expect a ride report soon, today we offer a Pro Bike Profile of Jeremy Powers’s Focus Cayo Disc Bike that he used as a gravel bike. We fully admit that much like the rules governing gravel racing, the guidelines defining a gravel bike are very much fast and loose. And speaking of fast and loose, that is exactly how one could define the course: loads of pavement and hard-packed dirt with enough climbs and descents littered with large chunks of gravel and patches of sand. Powers’s Focus Cayo is a road bike edging towards endurance geometry (the Izalco Max is Focus’s more aggressive-minded frame). Well over 400 riders came to the Grand Fundo on everything from 23c tires to full-on mountain bikes, although the choice of Clement Strada LGG 700x28c tires on his Zipp 202 clinchers were ideal, and the Cayo had just enough room to accommodate the size. Having said that, if the threatening rain had actually come down and turned the course muddy, Powers might have had to fight through issues with lack of mud clearance in the front fork. The Cayo Disc comes with what the company calls Rapid Axle Technology (R.A.T. ), which they have used on their cyclocross frames for the past two seasons as well. These are designed to offer the stiff benefits of a thru axle while offering a faster wheel change time than a quick release due to only needing to rotate the system 90 degrees to unlock the T-pin on the other side of the axle. The head tube sported the bulk of the other features of the bike. On the front , a Cable Routing Plate (C.R.P.) is used on the frame for a conversion between mechanical and electronic cables, allowing for routing of either without needing additional entry ports on the frame. The head tube itself is edgy (literally, if not figuratively) with the meeting of the head tube and top tube creating two very distinctive corners. Focus designed their head tube around a tapered system, with a 1 1/8-inch bearing in the upper steering head on 1 ¼-inch bearing in the lower steering head. 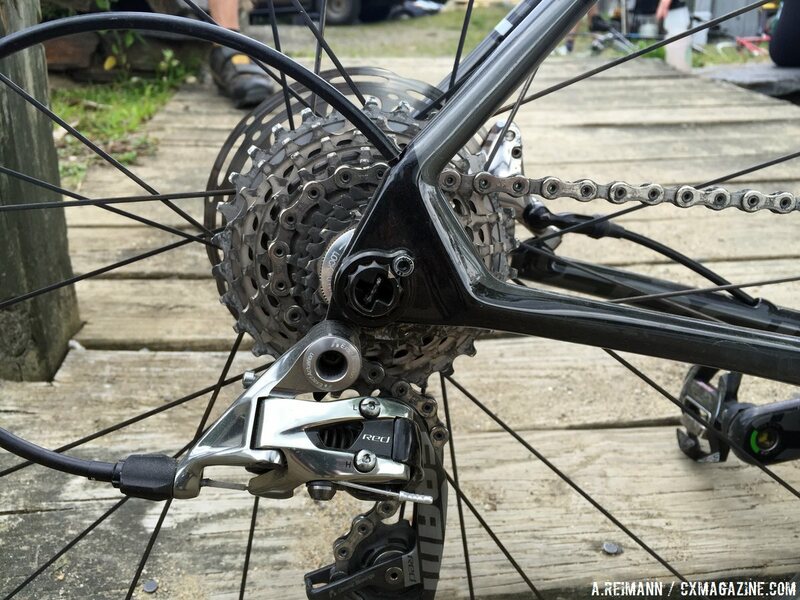 As for the build, Powers opted for a double with a SRAM Red 22 drivetrain and HydroR brakes. This was the more common choice with all of the climbs and descents, although we did spot Ellen Noble managing the full ride on her new CX1 drivetrain that was part of a recent sponsorship deal through SRAM and the JAM Fund. Powers used Zipp Service Course SL components for his cockpit, seatpost, and water bottle cages, and his build was finished off with Time RXS carbon pedals.